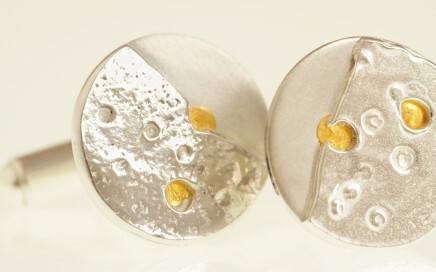 Textured circular cufflinks made from recycled silver. The cufflink face presents a smooth semi ellipse adjacent to a textured surface pitted to resemble the texture of the moon. Silver indentations are joined with two 24 carat ethical gold fused indents on each cufflink .